Maximized windows usually cover the whole screen but the taskbar if it is configured to be permanently displayed. The main use of a maximized window is obviously the increased space for the interface of the window or application. The drawback is that it covers every other application or window making them more or less invisible on the desktop. Some users might want to keep another part of their screen from being covered by maximized windows. This can be useful to display always visible widgets, chat interfaces, media player or information on the computer. 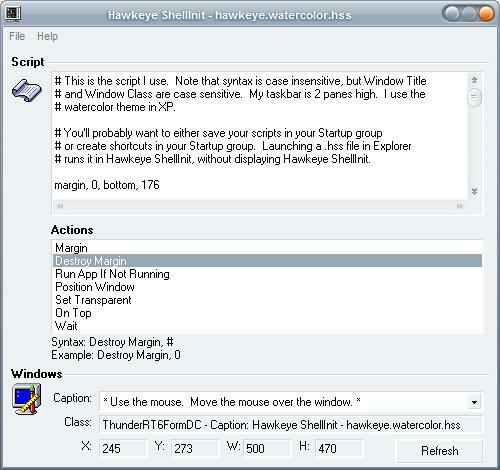 Hawkeye ShellInit can create margins on the screen that maximized windows will not cover. The effect is similar to that of the Windows taskbar but more flexible since users can run any kind of application in that area. Hawkeye Shellinit comes with its own basic scripting language that does take a few moments to get used to it. It is not really that complicated but a better help would be really appreciated. Another command is being used to add applications that are allowed to cover that area with their window and another to position those windows exactly on the screen. The best way to get started is to load the Watercolor script that resides in the same directory as the main application. The software has a size of less than 100 Kilobyte and is flexible enough to cover most uses. A more intuitive interface and a tutorial would be nice though.